Infused liqueurs are the hot new ingredients for cocktails. With more than 30 infusions plus dozens of drinks to use them in, Infused combines spirits like vodka and rum with fruits, flowers, herbs, and spices to create superior liqueurs. Take the Gibson and give it a kick with Onion Vodka. Cool down with Watermelon Martinis on warm summer days, or get the heat going with Hot Mint Chocolate spiked with Mind Vodka, a perfect antidote to cold winter nights. Many infusions pair with multiple recipes: herb-infused vodkas enliven both the Rosemary Martini and the Strawberry Basil Martini. Chocolate Vodka is the indulgence in the Chocolate Martini, Brandy Alexander, and the Grasshopper. The versatility of each infusion makes giving a bottle of homemade liqueur a unique gift for any drink connoisseur. 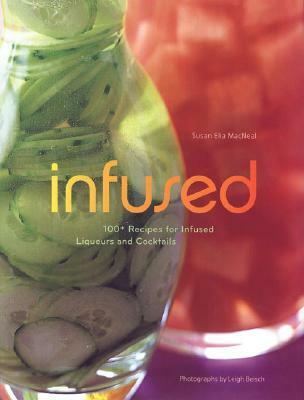 With tips on how to shake, stir, and chill, and enough recipes and ideas to reinvent any party, this colorful little book is the ultimate infusion of fun. Susan Elia MacNeal has worked in book and magazine publishing for over a decade. She lives with her family in Brooklyn, New York. Leigh Beisch is a San Francisco-based photographer whose work has appeared in Chronicle Books' Viva Vodka and Viva Margarita.